IN THIS second instalment of a two-part feature on the exploits of Fenian ‘mayhem maker’ WILLIAM MACKEY LOMASNEY, the small Irish-American soldier from Cincinnatti, Ohio, who was born in 1841 of Cork parents, Sinn Féin TD AENGUS Ó SNODAIGH continues his look at the life and death of ‘The Little Captain’. LOMASNEY’S invitation onto Clann na Gael’s Revolutionary Directory in 1880 heralded one of his most active periods, being involved in the American Land League, a support organisation for the mass movement active in Ireland at the time. Lomasney was also experimenting with new military technologies, in particular dynamite, and was very successful in sourcing and smuggling large quantities of weapons into Ireland as part of the plan to rearm the Irish Republican Brotherhood in Ireland and also to arm the communities to oppose the regular tenant evictions which stained this period. “The people, goaded into frenzy by studied injustice, may rise against some constituted authority. A local eviction, a collision with the soldiers may ensue, and our people be shot down in multitudes. It is here that the offices of the American Land League will be called into requisition. Devoy said after his passing that Lomasney was “a fanatic of the deepest dye, and the harder to argue with because he never got heated or lost his temper”. This cool-headedness was to stand Lomasney in good stead in the months and years ahead of him as he planned his dynamite campaign in England. While in Paris he also met Charles Stewart Parnell at the behest of John Devoy. He said of this meeting that Parnell agreed with the aim to rid Ireland of Britain and that he was “eminently deserving of our support, and that he means to go as we do in pushing the business” (Devoy’s Post Bag Vol II, p40). “These foolish affairs in England are believed to be the work of ODR’s men. The amount of folly and bungling in connection with these attempts is simply disgraceful. They will have to clear out at once. In March, Rossa’s men continued their campaign with an attempt to blow up the Mansion House in Liverpool, the device consisting of a wooden casket with iron cladding inside and nearly 40lbs of explosive. On 16 May, Dale Street Police Barracks in Liverpool was attacked. Liverpool City Hall was the target on 10 June. Loanhead Police Barracks in Edinburgh was hit on 12 June. Lomasney was in Ireland around this time and was also continuing his preparations, seeking $100,000 from the Directory for the campaign and getting an advance of $5,000 in January which used to build up stores of dynamite in Ireland, England and even in France. He was overseeing the transfer of weapons from the weapons stores he’d built up on the continent to Ireland to ensure that, in the event of a rising, they had a good stock of weapons as it would be “folly to be talking of revolution or even thinking of engaging in anything that may force a crisis” otherwise. He returned to the USA on 20 July to give a report on how the preparations were going and to encourage greater funds to complete the task ahead and to recruit and brief the units which were to carry out the attacks in England in particular. During this time in England he was working under an assumed name, supposedly as a representative for the Connolly Labour Bureau, Castlegarden, New York. He was able to use this cover as a recruiter of emigrants for jobs in the USA before they set sail to keep track of Rossa’s operations and his operatives coming into the country using the excuse that they were looking for work. Captain Mackey next pops up in 1884, but in the meantime Rossa’s campaign continued with mixed successes. On 12 May 1882, the day after The Invincibles assassinated top British officials Cavendish and Burke in the Phoenix Park, London’s Mansion House, official residence of the Lord Mayor of the City of London, near the Bank of England, was the target. These incidents resulted in the authorities setting up the British Secret Service to destroy by any means necessary the Irish republican secret societies, in particular the IRB. The authorities had their first major coup with the capture of an arms dump in Clerkenwell in north London (near the prison attacked by the IRB in 1867) on 16 June. Whether it was Rossa’s or Lomasney’s dump isn’t obvious at this stage and the British weren’t fully aware of Lomasney’s plans. They had, though, very highly-placed informers in the organisation, Henri Le Caron in particular. The value of the arms dump was put at £40,000, including as it did 400 rifles, nearly 80,000 bullets and 60 pistols. In September 1882, rumours abounded that the Clan was planning a ‘spectacular’ in Ireland and Lomasney’s name was associated with it, with wags saying that Dublin Castle was to be the target. It seems, though, that no attack was planned but if it ever was it would have been aborted such was the level of the rumour and gossip about it. Two dynamite attacks were carried out on targets in Glasgow in January 1883, destroying the gasworks and a building in Buchanan Street Railway Station. An attempt was made also to wreck the Canal and Clyde aqueduct. Then, 15 March saw another dynamite attack in London which was heard nearly 50 miles away. This time it was the new government offices and the offices of The Times newspaper. Two of Rossa’s Volunteers were captured in Liverpool that month on their way into the country. Coupled with the arrest in October 1882 of Dr Thomas Gallagher, who was preparing nitro-glycerine in his premises in Liverpool with the intention of targeting the British Parliament at Westminster, Rossa’s campaign was near an end. Captured along with Gallagher were five other Volunteers and between 400lbs and 500lbs of explosives. Clan na Gael was ready to take up the reins with its own campaign, which had been under much consideration because many in the organisation and among the public in general had faith or at least a hope that Home Rule could be delivered. But with the British Government reneging on Home Rule, the leader of the Irish Parliamentary Party, Charles Stewart Parnell, being vilified by Establishment newspapers and by the Secret Service the IRB’s New Departure (parliamentary, agrarian and military activities) strategy was in trouble. In launching its campaign, Clan na Gael hoped to force the British into negotiations. In Lomasney’s plan of campaign, the targets for the bombing campaign were to be economic and prestigious targets with no casualties or minimal casualties, having learnt from the British public’s reaction to the Clerkenwell explosion. An explosion in the underground between Charing Cross and Paddington rail stations in London on 30 October 1883 signalled that the Little Captain’s campaign had begun. 27 February saw a further attack on Victoria Rail Station and bombs discovered in three more. The attacks caused panic among the British royal family and the administration. Queen Victoria had her security detail substantially increased and her train journeys took double the time due to security checks. Among the attacks which are attributed to Lomasney in this period were the three attacks on 30 May 1884 in London aimed at the Army and Navy Club, the junior Carlton Club and the newly-established Irish Section of Scotland Yard’s CID (the forerunner to Special Branch). The latter destroyed the offices when a bomb placed in the adjacent public toilet levelled the building, destroying the files being collated on republicans and republican activities in Britain. An attempt was also made to blow Nelson off the top of his column in Trafalgar Square but the bomb was defused. On the evening of 13 December 1884, shortly after 6pm, three men hired a boat and rowed up the Thames as far as London Bridge. There they steadied their craft and tried to attach a bomb to newly-installed security grilles under the world-famous bridge. 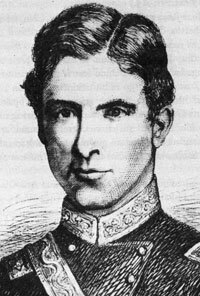 The subsequent explosion, obviously premature, caused little structural damage but resulted in the deaths of the three IRB Volunteers: William Francis Lomasney, his brother-in-law Peter Malon, and John Fleming. A Thames waterman gave a description matching William Lomasney as the man who hired the boat for the fateful journey. Their remains were never found and in fact the police believed that they had survived the bomb blast and offered £5,000 for information leading to their capture. The attack caused consternation among the security services and protection for public figures and buildings across the city was intensified. Yet despite the set-back and the extra security, others in the IRB’s active service units continued the attacks. Henry Burton, James Cunningham and Luke Dillon succeeded in breaching the Tower of London and the Westminster Parliament’s defences in broad daylight on 24 January 1885. Unaware that he was under surveillance, Cunningham carried the bomb into the Tower of London, strapped to his body under a heavy overcoat. Just after dinner, the bomb exploded while he was still making his exit. Dillon and a ‘woman’ (one of the team disguised as a woman maybe) entered Westminster Hall, one going to Crypt to place a diversionary bomb to allow the other to target the Peers’ Gallery. At 2.10pm, the Crypt device started smoking and then exploded as a police constable tried to remove it. The explosion saw the constable guarding the House of Commons move, whereupon a bomb on a short fuse was dropped into the chamber, exploding at 2.13pm. The following month, a cache of Safety Nitro Company of San Francisco dynamite was found in a vacated house in Harrow Road, in north-west London. The tenant’s description matched that of Lomasney.